Fixed an issue that was causing all players rank to show up as 10 on the custom lobby screen. Fixed Terrain Intersection bug that sometimes prevented high weapons from targeting low targets. Fixed an issue where the map, Pinwheel, had a black stripe running through it. There are various changes to the UI Panel and tooltips primarily aimed at making the game more intuitive and accessible for new players. Some of these changes will take a bit of getting used to for experienced players. In-game chat panel moved from the centre of the screen to the left to avoid getting in the way of the player and obscuring their vision. The old names are incredibly bland, this makes them sound more appealing and also suggests the role of the ability. Incursion renamed to Deploy Incursion. For example, Zeus and Avenger share the same tile, likewise for Orbital Fabricator and Gateway. This makes swapping between the factions and memorising the units and counter system easier, as well as finding the more common units and using hotkeys for them. Not everything can be aligned perfectly as some units are unique to that faction. Economy structures sounds better grammatically and is a more recognisable RTS term. A new player is going to have no idea what Orbitals means, whereas Technology (Tech) is a general RTS term which players will identify. Technology also more accurately describes the purpose of these buildings as they unlock new units as well as the orbital abilities. 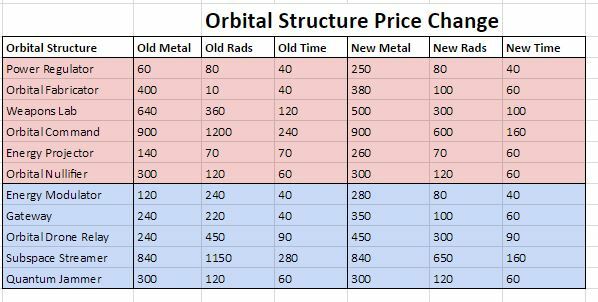 Naming them Orbital buildings was probably done before they unlocked new units. This also avoids the term “Orbitals” conflating the abilities and the structures. Fixed an error where Orbital Command said it was unlocking Nano-Transport which is now a substrate ability. Improved the wording in various Orbital ability tooltips. Fixed inconsistent grammar or style in the tooltips. Previously Orbital ability tooltips had a full stop at the end while most unit tooltips didn’t. Now every tooltip ends with a full stop. Updated several unit tooltips to provide more information. When possible, have the same or equivalent ability on the same tile. Renamed “default” to “normal” to not confuse players when an option such as Air Units is not set to default. Rearranged the order of the dropdown selection so that it progresses from lowest to highest. Previously Default was at the top. Aside from obviously making the game more balanced and fair, these pillars served as the goal for this patch. Refine the Counter system to function properly so that units are not countering more than they are supposed to, such as Athena's countering Frigates. Increase strategic diversity so that games feel unique and require players to think on their feet instead of repeating the same things every match. This is mainly done by nerfing units which are overperforming and buffing units which are too weak or overpriced to make them viable. Open up the late game tech: Most matches, even team games, don’t involve players making use of late game tech such as heavy air units, Dreadnaughts and Hera/Eradicator. We want players to make use of these tools and are making them more accessible. Make Substrate less Radioactives intensive: Substrate suffer from having much higher radioactives costs compared to PHC. This makes them underperform on maps low on Radioactives. Weaken exploitative “cheese” strategies such as Artillery Post spam, rushing air units or an Orbital Fabricator to spawn Sentries in your opponent's base. Improve game flow by making base defenses less potent. It required lots of practise learning which maps you can and can’t double cap on. This isn’t fun. This is being acheived by increasing Engineer build time and delaying some Orbital abilities. to compensate, Engineers will be receiving a cost reduction to allow for a much faster Factory to get into the action. The starting storage of 500 was too punishing compared to Substrate who have unlimited storage, even at a high level it was difficult to avoid wasting resources by maxing out 500 storage. Increasing the starting resources of PHC gives new them a more breathing room where resources are not wasted. The Engineer and Constructor were extremely fragile for their cost of 400. Losing an Engineer in the early game was disastrous and it often happened instantaneously before the player had a chance to respond. This was frustrating, especially for new players, and it also made Dominator and Furies far too potent at harassment, overshadowing the Punisher and Hades. The Harvester is incredibly fragile compared to the PHC Refinery. Not only does it have a pitiful amount of HP, it is also vulnerable to interceptors due to being an air unit. It’s still going to be weaker to compensate for its ability to move between points, but its health will be more fair. Frigates would lose relevancy after the first few minutes as they were easily countered by Cruisers. We want Frigates to fill a bigger role in the counter system and be more effective against Cruisers as there are so many other ways to counter them on top of their lack of scaling with upgrades. The Hermes did not perform enough recon for its cost to provide enough value. We are increasing its recon abilities to make it more desirable. With the nerfs to the Medic, the Brute and Archer need buffs in order for PHC frigates to be viable against Athena/Maulers as well as Reapers. The Medic’s heal rate was too high, large numbers of Medics gave Cruisers and structures too much durability. It is also getting a movement speed reduction to prevent it from automatically running forward in front of other units. The Martyr was too weak compared to other Frigates and didn't fill any purpose compared to the Reaper. 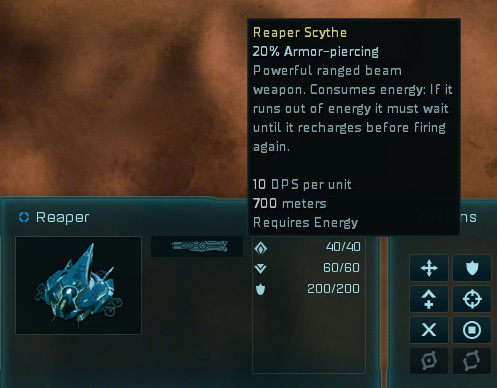 The Martyr is now very powerful but lacks the armor piercing and range of the Reaper. 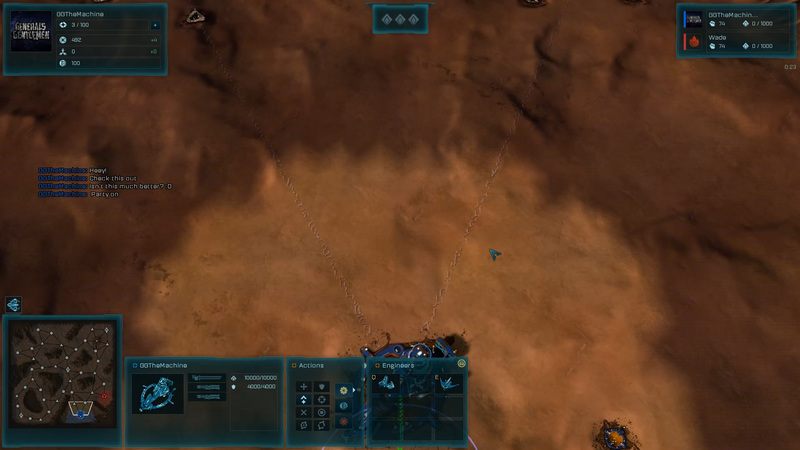 The Reaper had a very high desired attack range which made it kite backwards away from enemy units. This made the Zeus ineffective against Reapers since it would rarely be able to get within range to use its main weapon. This will make the counter system function better. The Capacitor had a large energy storage, but once it depleted it took too long to regenerate. It also had far too much health which made it exploited as a cheap damage soak. We are Increasing its energy regeneration in exchange for lowering its health to make it perform its intended role as a support unit more reliably. It is also getting a movement speed reduction to prevent it from automatically running forward in front of other units. Movement speed reduced to that of Reaper. The Sky Cleanser over performed with too much health and damage, yet it had inconsistent damage due to its low accuracy. It is getting an accuracy increase in exchange for less damage to provide more reliable damage output but also heavily nerfed overall. The Masochist was too strong for its cost and is getting its pricing fixed. The Avenger had an underlying design problem where it was very powerful against other Cruisers and even Dreadnaughts, instead of just the Frigates like it is supposed to. Most players under estimated how potent the Avenger is because of how quickly they die, but they are so cheap and with so much damage that armies of Avengers would take out anything (apart from buildings.) One of the reasons causing them to over perform vs Cruisers and Dreads was its high damage but low projectile speed, resulting in it overshooting and wasting shells on Frigates, which wouldn’t happen vs Cruisers due to the higher health pool. In order to make the Avenger perform the role of anti-frigate more consistently, it needed more movement speed, less damage in exchange for less health, but it also needed to get less damage in exchange for faster projectile speed. The 75% damage reduction may seem extreme, but the projectile speed buff increases DPS. It is also being properly priced for a Cruiser and losing its rapid shield regeneration compared to other cruisers. The Artemis is too fragile for a Cruiser, it was destroyed far too easily and this weakness was visually unintuitive for a unit the same size as other Cruisers. We are increasing its health in exchange for a cost increase, as well as increasing its missile attack cooldown to prevent it from overperforming against Frigates. Despite this, the missiles had the wrong priorities for what they are most effective against. The Apollo was underperforming, and like the Artemis, it was too fragile for its size. It’s receiving an increase to its health and damage in exchange for a cost increase, while gaining some armor piercing so it scales better against heavy PHC Air craft. The Mauler and Athena were dominating the meta far too much and we are nerfing them to allow more different unit compositions. They are receiving a small damage reduction to the main weapon so they take longer to destroy other cruisers, as well as large damage reduction on their secondary weapons so they are much weaker against Frigates. The Mauler will still cost sllightly more than the Athena to compensate for the incredible bonus of the Assembly producing all basic units and not costing any Radioactives. The Hera had little health but high armour, which left it too vulnerable to armor piercing attacks. To buff the Hera as well as giving it more consistent survivability, it’s losing some armor in exchange for health. The role of the Eradicator was incredibly unintuitive; it is a big slow heavy Cruiser yet it filled the role of a glass cannon, with insanely high damage but low survivability. To make the Eradicator more visually intuitive and fill a role unique to Substrate, it's get armor in exchange for losing some of its damage. The Eradicator also took too long to build and costed too little Logistics. The damage output of the Destructor was much less than the Artemis so it's receiving a damage buff to equalise their performance. The secondary weapon is being reduced as it was too powerful against Frigates. The Caregiver healed pitiful amounts compared to even the Medic despite its area heal. It needed a huge buff to its heal rate for it to be viable, and it costed far too much logistics and took too long to build. The Caregiver will now help sustain Substrate against the AOE damage of the artillery post. The nemesis suffered from its chance to miss which was quite frustrating when combined with its long reload. We are increasing its accuracy so it no longer can miss and fixing its under priced logistics. The Mobile Nullifiers were overpriced at five times the cost of the Orbital Nullifier structure. The Mobile Nullifiers were neglected in favour of the orbital and structure jamming. The Charon was extremely over priced and as a result was never used. It also suffered from inconsistent survivability due to low health and high armour. Dreadnoughts were rarely seen as amassing cruisers was more cost efficient on top of the investment of a Dreadnought resulted in too much lost momentum. We are globally lowering the cost of Dreadnoughts to make them more viable and increase strategic diversity. The Substrate Dreadnoughts were underperforming with no armor compared to the 90% damage reduction of the PHC Dreadnoughts, while the Overmind and Retributor had too low damage. The Overmind was not only the weakest Dreadnought, it also costed too much Radioactives. The Overmind now has incredibly high damage output with all the Drones, but it is still countered by mixing in anti-drone units. Now spawns 5 Drone Swarms instead of 3. The Retributor is receiving a large damage buff to put its performance in line with the Hyperion. With the addition of armour to Substrate Dreadnoughts, the Prometheus needed to get armor piercing to compensate. The Overloaded Quad Pulse Cannon ability is receiving a damage reduction as it was able to destroy some Dreadnoughts in a single volley. Since the Substrate Dreadnoughts now have 40% armor by default, the Impenetrable Armor bonus needed to be reduced to not stack too highly. The Damage of the Cronus against heavy base defenses was far too low, yet it was difficult to destroy with units as it would automatically back away from enemy units while firing. Air rushing had become a frustrating and unfair part of the meta, so we've made a few changes to prevent air rushing from being so overwhelming. The Fury and Dominator are losing their ground attack as they were filling too many roles by being so potent at harassment. The Fury and Dominator now only fill the role of air superiority fighters, which will become more valued as Bombers and the newly buffed Gunships will now be required for harassment. They are also gaining some armor piercing to help their scaling against heavy PHC aircraft. The Dominator underperformed for its cost compared to the Fury. The lethality of the Punisher was too high with huge damage but low health. This meant it over performed when rushed early but once the opponent has a critical mass of anti-air it gets shot down immediately. In order for it to perform more consistently, it is losing damage in exchange for survivability. The Punisher was also too potent to be rushed out early, so it is now locked behind gateway to prevent frustrating air rushes. The Hades was too expensive for what it offers, especially compared to Punisher. The Strategic Bomber was too durable against anti-air without armor piercing, so we're trading some of its armor in exchange for health. We are also increasing its sight range to allow for easier target acquisition. We plan on opening up the utility of Heavy Air Bombers by allowing by allowing them to target units, but this will require a significant rebalance. In the mean time, they can now target Dreadnoughts. The Harbinger was still suffering from too little survivability, yet it had a very high lethality. In order for proper counters to remain consistent among PHC and Substrate, the air Harbinger is receiving some armor. The Harbinger is also losing some armor piercing to make it consistent among Substrate and PHC Dreadnoughts. The air scouts were far too weak, they were shot down before they could provide any proper scouting and they didn't have enough of a sight range advantage over Air Interceptors for them to be viable. Their weapons were also completely unnecessary as they did almost no damage. Air Scouts are losing their weaponry to make their role more intuitive to new players. The Instigator had issues capturing territory without flying out of the capturing radius. It’s losing some movement speed and its weak weapon is being removed so it doesn’t try engage targets. Despite being locked behind a late game structure, the Air Marauder and Air Rampager were underperforming and needed some buffs to make them viable. They are also receiving also a movement speed increase to make them feel more like air units instead of flying land units. The Air Marauder is trading some armor in exchange for health to make its survivability more consistent. On top of the Rampager having far too little health, it suffered from a bug making its main weapon ineffective. It now has a modified version of the Air Marauder's weapon with the original Rampager visuals. We are allowing players to build the scout planes from the nexus to allow for more scouting early on. Players can see their opponents strategies and react instead of the “Build order Poker” where players blindly counter each other without knowing. The durability of the PHC Nexus was inconsistent compared to Substrate. It was practically immune to all damage apart from things with heavy armor piercing such as artillery and Harbinger. Increasing its health in exchange for losing armor will also make it more resistent against Air Harbinger base snipes. The Substrate Assembly is a massive advantage not only because it shares all basic production, but also because it costs no radioactives. To mitigate this, we are reducing the radioactives cost of the armoury. The Dreadnought production structures are getting a build time decrease to help make Dreadnoughts more viable. The Aviary and Advanced Air Factory did not need to be locked behind the Dreadnaught production structures as they produced weaker units. We are opening up heavy air units to create more strategic diversity and counters. The radar towers were often neglected due to only providing minimal detection range. We are increasing the performance of the radar range makes them desirable, as well as increasing their cost and lowering health to make Radar Towers a strategic investment which form as a contention for the players and incentivise bombing runs. The pricing for tech buildings was extremely inconsistent and did not reflect their value. This resulted in little player decision making, a lack of strategic diversity and the late game tech tree being too inaccessible. Some buildings had negligible costs and were built with no consideration, while the higher tier Orbital Structures cost an hefty amount and were mostly neglected as a result. There was also a discrepancy between the costs for PHC and Substrate, where Substrate suffer due to a far higher Radioactives cost but less Metal. Tech buildings are being properly priced for their value. Base Defenses dictated far too much of Ashes; their potency stagnated the game by cheaply locking down sectors of the map early to create a long, tedious and ineffective dynamic of trying to clear them out. There was also a huge discrepancy between the potency of base defenses, mainly favouring Substrate. The following changes close the gap in performance, and also distinguish the different types of anti-air defense. Most of the base defenses suffered from a minimum range which prevented them from firing at enemy units which are too close. The Smarty System was very weak and had pitiful damage for its cost. It paled in comparison to the Annihilator and was trivial to couunter. The Artillery post was not only over performing, it also didn't feel much like an artillery installation as opposed to an ultra long range base defense. In order to make it feel more like a proper artillery defense, it's having its projectile speed lowered and accuracy reduced to make it weaker against mobile armies compared to static targets. The range was also too high, with no proper way to mitigate its impact. Projectile speed lowered to 33% of its current speed. Accuracy reduced to make it weaker vs mobile armies. The Drone Bay and Repair Bay were both too cheap for the impact they have. We are increasing their cost so they don't overshadow all other PHC base defenses once they are unlocked. The Annihilator and Heavy Annihilator were too cheap for their high damage output, stopping armies many times over their cost. The Disruptor Cannon was too durable for its damage output. It would take almost a minute and a half for an Artemis to destroy it. The Drone MRV was inaccessible due to its high Radioactives cost. We are exchanging some Radioactives for Metal and increases its health so it’s not destroyed by Artillery units so easily. The damage output of the Skyender was incredibly underwhelming given compared to alternative anti-air despite the heavy cost. The Sky Ender is receiving a heavy buff, and is now designed for anti-heavy air while Starburst with more splash damage is designed for groups of light air. The changes in 2.03 overbuffed the Starburst which made it overperform. It is receiving a hefty damage reduction to balance its performance for its cost and not overshadow the Sky Ender. The Constable was too fragile and with too low damage. It was easily taken out by the bombers it was supposed to counter. The Falcon was so cheap that it was a no-brainer upgrade to the Constable, which put PHC in a difficult place for static anti-air as the Falcon was weak compared to other defenses and the Air Eliminator is expensive and is locked behind weapons lab. We wanted the Falcon to provide more consideration, while being a potent mid game anti-air defense strong versus groups of light air units. The Air Eliminator suffered from inconsistent durability due to low health, but high armour. This left it practically unkillable with standard damage but too vulnerable against Armor Piercing attacks such as Artemis or Destructor. The Sentinel was too durable compared to other base defenses, especially given its high damage. The Oblivion was suffering from inconsistent survivability; less health but more armour actually makes it weaker than the Sentinel against armour piercing attacks such as Artemis and Disruptor, the units which are normally killing them. The Pulverizer and Exterminator were too durable for their damage and range, which made it too difficult to counter with artillery units as they would not be able to outrange it. Being locked behind the most expensive tech building, the Subspace Streamer, made the Regenerator rarely used. Moving the tech requirements to the Energy Modular will make the Regenerator arrive at a more suitable time, and is more intuitive and thematic to the role of the structure. All summon abilities now have a consistent cost increase rate, as some were ramping up slower than others. Engineer drop was too cheap for how valuable it was. Probing Force is too cheap for how much damage it can inflict. Like a few other summons, Probing force ramps up in cost too slowly compared to other summons. To fix this inconsistency, all Summons will now increase in cost by 25% each cast. The Sapper was a very underpowered and neglected ability. We are increasing the health and damage of the Sapper turrets to make it more desirable. Drone Swarm was overperforming for cost. We have some more changes in mind for future patches to make this ability more consistent. The EMP Pulse way too powerful for only 100 Quanta, especially as many core Substrate units such as Mauler have only a fraction of their health compared to Shields. The damage has been reduced so it’s not as potent versus Dreadnoughts and Heavy Air Units. Deploying Emergency and Serpentine Turrets was used to double cap two relays at the start of the game. Rush build could be used to boost the nexus at the start of the game, allowing for a fast engineer and double capture. Just like the Charon, Nano-Transport is an overpriced ability which is completely neglected. Plasma Storm was overperforming for cost. Kill was far too powerful. It can takes a very long time and amount of resources produce a Dreadnaught, they shouldn’t be countered instantly by an ability. Kill will still remain powerful vs Dreadnaughts, but now there is opportunity to pull back a wounded Dreadnaught. There is an unfair damage discrepancy between Detonate and Orbital Strike. There is also a difference in armor piercing, but that mainly only matters versus Dreadnaughts. There is no reason for these abilities to perform so differently. Using artillery units was quite frustrating as they would not properly utilise their maximum range. Instead, they move would towards medium range, often getting targeted by base defences as a result. Artillery units will now close much less distance, and issuing a stop order will force them to stay in place and fire without moving. Units affected are Artemis, Destructor, Hera, Eradicator, Nemesis and Chronus. Aven is a nice 2v2 map but it was predictable and repetitive. Players fight over the high ground with the Turinium generator because they’re almost the only pathway into your opponent's base. Aven also had a very small amount of Radioactives, which limited the player's ability to make use of their full tech tree and had a inconsistencies and unfair advantages due to the asymmetric layout. Added in additional Radioactives Deposits and made them more accessible. Cygnus suffered from having unfair spawns; the south side had the two starting relays further away from the north spawn. This prevented the south from double capping while the north could. The map also lacks strategic diversity as the middle contains an abundance of resources while being the shortest attack path to your opponent's base, while the edges have no deposits at all. Made the deposit layout symmetrical for both sides. Added Dead zones to the edge of the map to tidy up the minimap regions. Espana had little strategic diversity as the centre of the map had lots of resources while the outside corners had none. In most 1v1 games, Turiniuum Generators are neglected so we wanted to shift some of the concentration of resources away from the middle onto the outside paths to encourage more variation. Moved a radioactives deposit from the corner of the spawns to the other nearby rad relay to allow for more harassment. Italia looked a bit strange due to how much empty space there was without any relays. It also had some balance problems associated with the layout of the terrain such as how the horizontal pathways across the middle of the map are closer to the top player, and how the south player has an additional pathway above their nexus. Only having a single connection through the sides of the maps meant that summoning units via Orbitals to cutoff resources was too effective and very frustrating. It’s still a powerful strategy as there are several cutoff points, but now not every side point is. Connected more of the side relays to each other. Blocked off the pathway above the bottom Nexus. Pyn was not a perfectly symmetrical map which created a number of balance problems and inconsistencies such as the central metal node favouring the south spawn. The disproportional allocation of resources meant there wasn’t a lot of variety in where players would be fighting over territory. We have spread out the resources more evenly and added some more to create more strategy diversity. Added a ramp on the other side of the Corner hills to allow for more action over the the Turinium generators. Centralised and evened out the middle basin. Equalised the distance of the two starting relays. 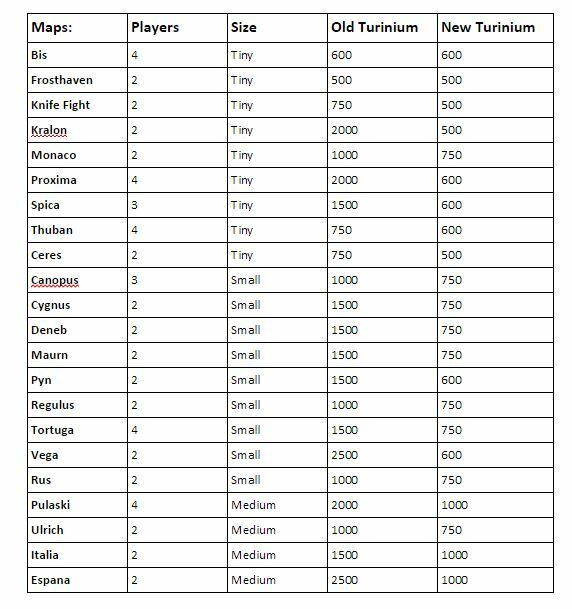 The following changes are minor updates for the maps already reworked. Since the original reworked versions are now in the game, there has been a lot more playtesting and feedback. The bottom right corner has two radioactives near each other, and the other non-base radioactives was too inaccessible in the top left corner. This resulted in matches on Ceres being predictable and repetitive, where players would fight over those two rads and that would often decide the game. Adding in another Radioactive deposit on the other side of the map will create more strategic diversity where holding the bottom right corner is less critical. It was also still possible to double cap from the top right spawn due to the proximity of the two starting relays. Games on Deneb revolved around the north of the map too much because it has more resources in a much shorter distance compared to the south. Adding an additional Radioactives Deposit on the south side will make the south less neglected. There is also an issue where one of the metal extractors on the right side can be destroyed by creeps at a nearby node up the hill. Moved around one of the metal extractors on the right side to fix nearby creep issue. Added a radioactivities deposit on southern radioactives relay. Fixed an issue where the bottom right spawn had one less metal deposit. The top left player had a slight advantage where they were able to double cap easier due to closer starting relays. Often maps have equal distances, but the player at the top benefits because of the spawning direction of the engineer. Monaco also suffered from a lack of strategic diversity due to the middle pathway being the safest (no high ground) and shortest path across the map, where the majority of metal was located. The bottom left corner should get more resources to incentivise players fighting over it. In general, Monaco has very little resources compared to other maps which prevents players from making use of most of the tech tree. Added Metal Deposits on the empty relay on the left side. Moved Metal Deposits from the middle to the right to incentive going on the right side. The Turinium Requirements in Ashes were not only inconsistent, they are also too high. Almost all games came down to annihilation of the enemy, with Turinium levels being ignored and neglected. Turinium Generators were still contested due to the additional resources they provide, but Turinium as a victory condition was not providing any strategic diversity and consideration from players. We have standardised the Turinium levels on the current and future ranked maps, lowering the Turinium requirements where it is too high and making it more consistent. 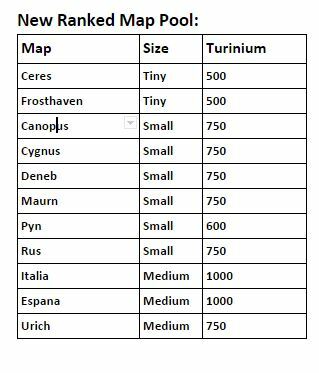 We used 500/750/1000 as the basis for Tiny/Small/Medium maps, but varied it slightly depending on how difficult Turinium acquisition is on those maps. In order to improve the automatch experience we have updated the map pool for ranked and unranked games. We are removing the least popular maps and ones not suited for competitive play. The new pool maintains a variety of different maps sizes and types to cater to all players. das the opt in is in a preview stat, so not all changes has been fully implemented althought some of them have. the air rampager hasent have any changes same for the harbringer, as for the eng 50 quanta is not much but you shoulde invest more into quanta and that problem solves itself. steam to choose test for opt-in 2.2,but download so slow,even to stop.For 20min,always 0KB/s. The 2.2 Opt-in has been updated! All changes have been edited into the initial post. I think they want to get rid of the early Sentry + Engi drop and delay it a bit. Like the patch a lot, though. They couldn't fix EVERYTHING but they did most of the "more potent" and "frustrating" aspects of the game. Old strategies will become obsolete, new ones will emerge! I think 50 Quanta for an Engineer is still a fantastic deal. Being able to instantly call one in and immediately start building extractors or defenses anywhere on the map is incredibly valuable. how about a freakin link to the 2.2 cant find it anywhere. everyone else seems to know.. screws MP up royally.. Never find a game more than 1.1 thats sad..
Go to steam and right click Ashes Escalation and go to "properties". Next, go to the tab "Betas" and select the "opt-in - v2.20 Preview". It will ask for a password but just leave it blank and it will download the patch. Appreciate this a lot. Couldn't believe it was so hard to get the info on how to opt in.. I'm glad to see that there are some improvements regarding modding, but I still have to ask: when can we see multiplayer mods? While I agree that one-sided modding in a multi-player environment would be unfair, and frankly stupid, why are we restricted from playing casual matches between friends with pre-agreed upon mods? There's hardly a case to argue against what consenting adults do between each other. In the 2.2 Opt in you could, I don't know if that's changed now with the full update. You can now! Modding was a big part of the 2.2 launch. Oh, that's great news then! I was rather confused by the link to the wiki article, which still explicitly states that mods are SP only. Doesn't seem to be the case. I just tried creating a mod with a map and somewhat tweaked unittemplates.csv. If I have it enabled, all the multiplayer options, including Custom Match, are disabled. If I disable the mod - they are enabled again. Opting-in back into the modder's build fixes the issue... which is weird, wasn't that the build that got pushed live? SO after the 2.2 my ashes intro screen is Stardock instead of Steam. Just didnt expect that, and it doesnt see my Sins game at the intial screen.. I prob explain very well.. When I clikc on the icon for Ashes a Stardock window pops up. It has Ashes, Sins, Off World, and Gal Civ. I own Sins and its installed, but this screen doesnt see it.. DOesnt really matter unless it should see my Sins, or it shouldnt be a stardock window since I purchased via steam. So how many mods are out there? I think there's 2 at the moment, my own one and The Ascension Project by Creature of Existence and TAG Utter.